The acrylic case clicks together, relying on the slight flexibility of the plastic in place of screws or other hardware. DO NOT FORCE ANYTHING! If flexed too hard, acrylic will break. All the pieces should assemble with minimal finger pressure. If a part is uncooperative, something is misaligned…back off and check your progress, do not press harder! To accommodate manufacturing variance among boards, there’s a tiny bit of “play” in the case dimensions. The finished case will have a slight rattle to it. This is entirely normal, and the case will hold together fine. 1. 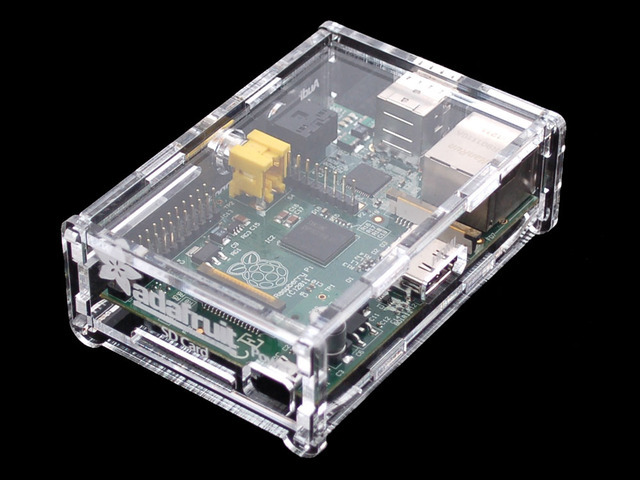 Remove the SD memory card and any cables currently plugged into your Raspberry Pi® board. 2. One of the case ends has cutouts for USB and Ethernet. There’s a small part attached inside the Ethernet cutout — snap this out and set it aside for later. The ring of plastic separating this piece can be discarded. With the paper removed, you’ll notice the four sides of the case have I/O ports labeled. This will help later to tell inside from out. Note especially the side with the HDMI port…if you find the case isn’t assembling right, it’s most often because this side is installed upside-down or inside-out. 4. 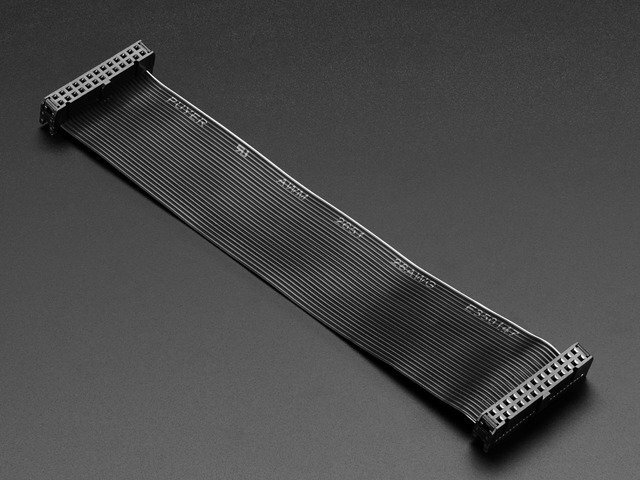 Optional: if using a ribbon cable to break out the GPIO pins, install this on the board first. The pin 1 stripe should be positioned nearest the SD card end of the board. The cable should go straight out the side, not double back on itself, and there is no clearance for a strain relief — remove it if present. 5. Position the first side of the case, with the Audio Out and Composite Video Out jacks. If you added a ribbon cable as in the prior step, slot the piece over that first. 6. On the underside of the board, under the Ethernet jack, install the small spacer piece that was snapped out in Step 2. 7. Position the bottom piece over the board, slotting it into the first side. There are no markings on the top or bottom piece — they are interchangeable and work in either orientation. 8. Turn the board over and install the top piece in a similar fashion. 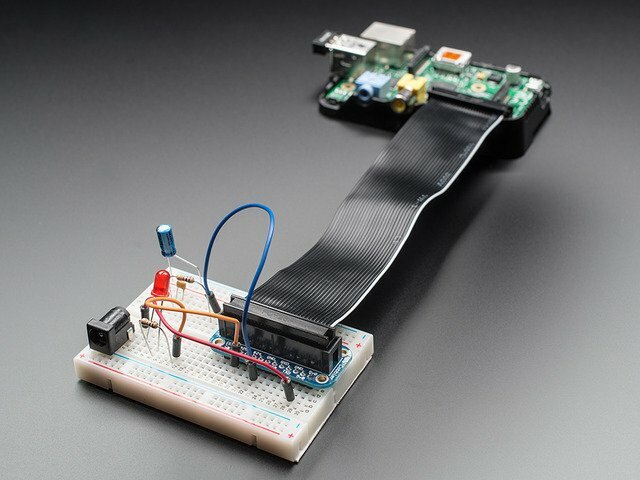 Or you can optionally leave the top off for full access to the GPIO and JTAG headers and the ribbon cable connectors. 9. Position the second side of the case (with the HDMI video port), slotting into the tabs on the top and bottom pieces. If this seems wobbly or lopsided, you might have this piece upside-down or inside-out. Check for the “HDMI” label and orient this correctly over the jack. 10. Install the first end of the case: slide the top of the end piece over the two top hooks first, then, using very light pressure, pivot the end piece downward over the bottom two hooks. It should click into place without difficulty. If you encounter ANY resistance, stop! Do not force this piece or you will break the plastic. Back off, check the alignment of the other pieces (especially the HDMI side), and try again. Gently. And remember, top to bottom — the other direction will break. 11. Install the opposite end of the case using the same technique. Top to bottom. 12. Insert the SD memory card, power and signal cables. That’s it, you’re good to go! To dismantle the case, remove the SD card and unplug all cables. Gently pinch the case to release the two lower “claws.” The end piece should pivot upward and can be unhooked at the top. Repeat with the opposite end piece, and the rest of the case then easily dismantles (don’t drop your Pi board in the process!). This guide was first published on Jul 29, 2012. It was last updated on Jul 29, 2012. This page (Assembly) was last updated on Apr 14, 2019.